Comics. No.5, May 1942, Bell Features Collection, Library and Archives Canada. On December 6th of 1940, during the second World War, William Lyon MacKenzie King, former Primer Minister of Canada declared the War Exchange Conservation Act (WECA), which was a measure used to protect the Canadian dollar and the general war economy (Kocmerac, 148). In this, comic books were listed as non-essential commodities that were deemed banned. During this time, Canadian superheroes became the most prominent features within Canadian comic books (Kocmerac, 151). Heroism became a very distinctive part of children’s lives, as they read and looked up to the superheroes who were prevalent within comic books such as Active Comics. In this work, the focus will be on Adrian Dingle’s fifth issue of Active Comics which was published for May of 1942. To identify how these heroes represented the idealized Canadian masculinity of a superhero to Canadian child readers, it is evident that we consider what makes a Canadian hero, why they are primarily men, the distinction between different aged superheroes and how child readers are influenced by these heroes. Throughout this work, we will uncover how the comic uses different age genres to depict heroism in Canada as a means of showing what it ultimately means to be a Canadian hero. 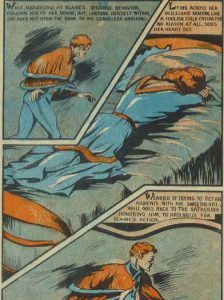 During Adrian Dingle’s issue of Active Comics in May of 1942, he depicts heroism as only masculine, however ranges from heroes being of different age groups. He makes it evident that heroes can be babies, teenagers and adults and does not limit the reader to believe in only one distinct type of hero, however, limits the reader to believe in only one gender of hero. 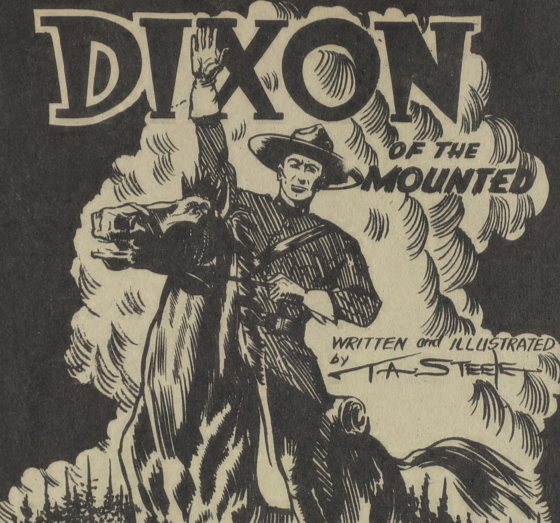 The first story in the issue, “Dixon of the Mounted”, shows heroism from Dixon, an adult who is after a murderer and attempted-murderer in hopes to save himself and society from the dangers of this man. His attempt is rather gory and very explicit in it’s use of fighting vigorously, showing that the adult form of heroism is to defeat through killing. Comics. Active Jim. No.5, May 1942, Bell Features Collection, Library and Archives Canada. The next story, “The Noodle – The Mighty Mite”, deals with heroism from a toddler who is out to save a female baby who was kidnapped by a Mummy, showing that he is out to protect society. Although he is a baby, his use of heroism exhibits strength and intelligence – to an extent far beyond a toddler’s capabilities, however does not display any acts of extreme violence or gore, showing that heroism from a toddler is different from that of an adult. Additionally, Active Jim, a teenage hero deals with providing safety for society by catching a leopard that escaped from a circus train with no form of explicit violence or murder. Overall, the heroes within this specific comic book, all have a few things in common. First, they are all brave individuals whom risk their lives to help society, and in doing this, inspires its readers, specifically children. Children are drawn in by these superheroes who will stop at nothing to retain justice, regardless of their age. Moreover, they also have their gender in common. All the superheroes within this comic book are men, showing the gender inequality that is prevalent in the text. Within this specific comic book, only men are perceived as heroes. Babic offers that comic books are “…predictions of societal downfall, disfigured gender roles, and mass children embracing violence as a natural mechanism of communication failed to note that adult readership soared alongside that of children” (Babic, 15). It is evident that Babic realizes this gender inequality that stems from comic books, and continues by centering on what children will retain from reading comic books that are unrealistic as only men are the heroes. Brown also offers insight towards the masculinity of heroes within Milestone Media (a novel on African American heroes) as a “comparison to the market-dominating comic books published by other companies which promote a popular trend of gender extremism” (Brown). In this, Brown tries to argue that newer comic books no longer have this ideology of a superhero being primarily a white male, however, have now gone into having diversity regarding gender and race. In Mollegaard’s book review on Age of Heroes, Eras of Men, she discusses the complexities of the superhero genre as “the marginalization of the female superhero” (Mollegaard, 431). Mollegard further uses this to distinguish that the misconception of “the superhero genre is simplistic drivel for adolescent boys” (Mollegaard, 431). So, the underlying statement through this, is that because the target audience for comic books was adolescent boys, masculine superheroes seemed to have fit as better role models for these young boys. Comics. The Noodle – The Mighty Mite. No.5, May 1942, Bell Features Collection, Library and Archives Canada. Although the comic fails to show women as superheroes, it does contain superheroes of different ages, ranging from babies to adults. Within The Noodle – The Mighty Mite, the superhero who is a toddler shows an expansive amount of knowledge and is very strategic in figuring out how to protect society in a non-violent form. A superhero such as The Noodle is very inspirational for young children, as they can believe that if a baby can do something, they can achieve a lot as well. Regarding Active Jim who is a teenage superhero, he is also inspirational for young children because of his age being close to young boys, and because he uses his strengths to defeat and outsmart the antagonists, similar to The Noodle, without violence. As Jim is still in high school and can look out for society, young boys may look at Jim as someone who is like themselves. Lastly, Dixon of the Mounted portrays an almost oppositional way to protect society, through using violence as a defence mechanism. The conclusion from these three, are that adults have more of a will to commit murders, whereas children and teenagers have a more forgiving element to them and are primarily out to help society. It is prevalent that each age group handles being a hero in a different way and is not like how we would expect it to be within our society. For the most part, we would expect teenagers to be the ones with a lesser understanding of the significance of life as the violent-heroes, whereas we would expect the adults to be the more responsible and inspirational heroes, showing the oppositional positions that the comic offers versus what society would think. Regarding toddlers, we see toddlers as innocent, naïve individuals within our society, very different from how toddlers are described within this comic. The comic does not reflect a modernized society in the depictions of violence based on age genres, however, it emphasizes oppositional positions in this through characterizing adults as the most violent. This comic would impact children in having distrust towards adults as they are depicted as the most violent, and give the reader an unrealistic understanding of babies, teenagers and adults. Babic discusses how comic books have a larger impact on children than adults. She states, “Children clearly sucked in the storylines at a larger rate than that of adults, but adults— especially soldiers on the front lines— fueled themselves on the junkets of their favorite superheroes.” (Babic, 15) This source overall offers a distinct view point on how heroism is depicted by children and what they will adapt to believing a hero is. Furthermore, Fradkin entails a small focus on comic books creating resilience for children. His article discusses the concept of “invincibility suggestion” and how comic books were and are used for children whom are fighting cancer or other diseases as they can relate to the superheroes in their journey to “fight evil”. Prior to this article, the idea of superheroes as characters to strengthen and inspire a child may almost seem absurd and unrealistic to some, but by putting it in this perspective, one can completely understand how a child with a condition would feel empowered by a comic book. Therefore, this shows superheroes as a beneficial factor for children (Fradkin). 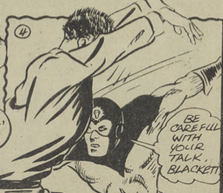 The idealized comic book heroes in Canadian comic books heavily influenced child readers during the Golden Age. The typical masculine superhero ascribed by different age genres shows diversity in ages, but lacks the diversity in genders, giving children an understanding that heroes are only masculine. In limiting children’s beliefs of what a superhero is, children were not only taught to be narrow-minded, but also to believe in men superiority, as the comic books described that women were not capable as the same things that men were. It is evident now that as society has evolved, this ideology of masculine superheroes is not as relevant as it was during the period of World War II, as we have familiarized ourselves with more women superheroes. Images in this online exhibit are either in the public domain or being used under fair dealing and are provided solely for the purposes of research, private study or education. Babic, Annessa Ann. Book. “Comics as History, Comics as Literature: Roles of the Comic Book in Scholarship, Society and Entertainment.” pp. 15-16. Fairleigh Dickinson University Press, ProQuest ebrary, Accessed April 2 2017, http://site.ebrary.com.ezproxy.lib.ryerson.ca/lib/oculryerson/detail.action?docID=10823569. Brown, Jeffery. Review. “New Heroes: Gender, Race, Fans and Comic Book Superheroes.” University of Toronto, ProQuest ebrary, Accessed April 6 2017, http://search.proquest.com.ezproxy.lib.ryerson.ca/docview/304394534/fulltextPDF/79ABD99412984EFDPQ/1?accountid=13631. Dingle, Adrian (a), TA Steele (w.a), Ross Saakel (w.a), and Al Cooper (w.a). 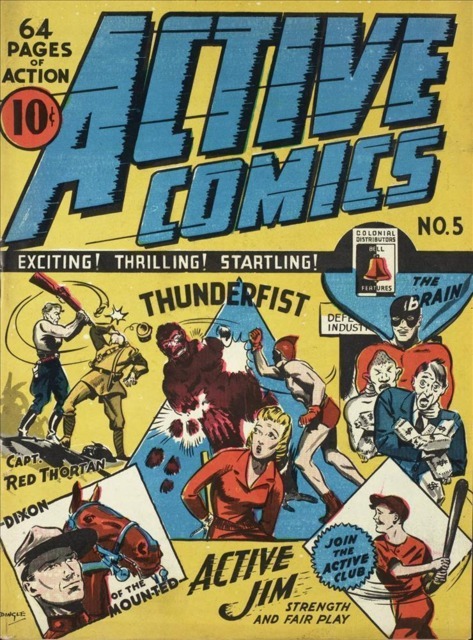 “Active Comics.” No.5, pp. 1-64. Bell Features Collection, Library and Archives Canada, Accessed April 2 2017, http://data2.collectionscanada.gc.ca/e/e447/e011166506.pdf. Fradkin, Chris. Book. “Shared Adversities of Children and Comic Superheroes as Resources for Promoting Resilience.” Child Abuse & Neglect. Vol. 54, pp. 69-77. Science Direct, Accessed April 6 2017, http://www.sciencedirect.com.ezproxy.lib.ryerson.ca/science/article/pii/S0145213416300187. Kocmarek, Ivan. Review. 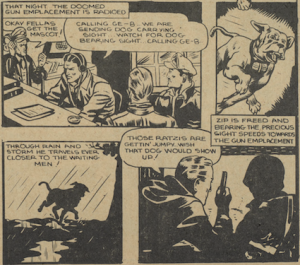 “Truth, Justice, and the Canadian Way: The War-Time Comics of Bell Features Publications.” Canadian Review of Comparative Literature. Vol. 43, No. 1, pp. 148-151. Project MUSE, Accessed April 2 2017, https://muse-jhu-edu.ezproxy.lib.ryerson.ca/article/611725. Mollegaard, Kirsten. Review. “Ages of Heroes, Eras of Men: Superheroes and the American Experience.” pp. 430-431. Scholars Portal, Accessed April 6 2017, http://journals2.scholarsportal.info.ezproxy.lib.ryerson.ca/pdf/15427331/v37i0004/430_aoheomutcsp2.xml. 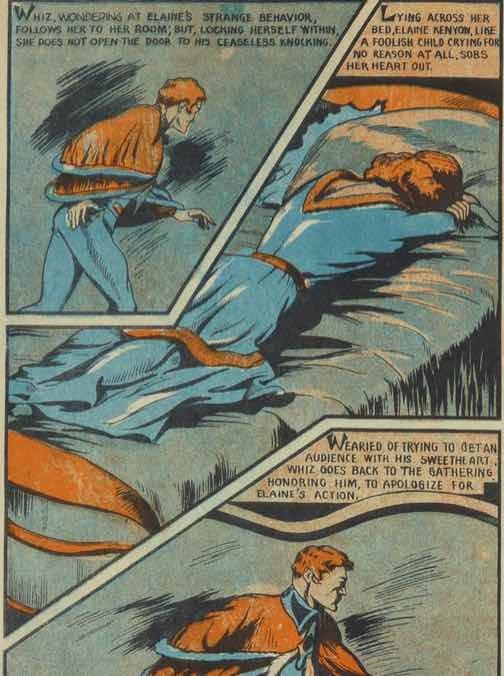 Social Redemption and Elevation during World War II in WOW Comics Issue #4. The Second World War was an event that sparked tremendous social upheaval in the western world, and entire societies were bent on achieving military victory. Such a focus on military service came to elevate it to the top of the social ladder. Soldiers in the service were praised for their bravery, sacrifice, and loyalty; being a part of the military effort during World War Two represented serious social elevation for all, making heroes of ordinary citizens. The status military service offered freely, regardless of ethnicity, represented for minorities and marginalized groups social redemption. Social Redemption here means an elevation of social status for groups who endured repression and discrimination in peacetime society. 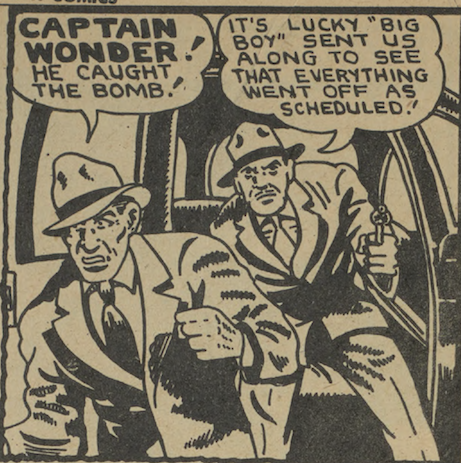 Media such as Issue #4 of WOW Comics offer a fascinating window into how wide audiences were fed this idea of wartime heroism. The characters of Lorraine and Elaine in WOW Issue #4, as well as women on the wartime homefront, are all excellent examples of how combat heroism and redemption was extended to a priorly marginalized group. Figure 1. E.T. Legault. 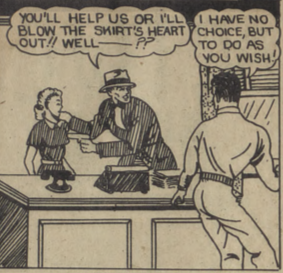 Panel from “Whiz Wallace.” WOW Comics, No. 4, January 1942, p. 42. Bell Features Collection, Library and Archives Canada. The largest marginalized group who found opportunity and redemption in the Second World War were Canadian women. Opportunities for work at factories, in the Royal Air Force, and in the Army brought women into the limelight. In contrast, the female lead of “Whiz Wallace” is treated with a spectacular lack of respect, and thus tackles social redemption more directly. Her name is Elaine, and in Issue #4 she becomes deeply distressed that other women are fawning over her dearest- the protagonist Whiz. She becomes overcome with despair in her rooms, despair that’s narrated with stark disrespect.“Lying across her bed, Elaine Kenyon, like a foolish child crying for no reason at all, sobs her heart out” (Legault, 36). These words make clear the esteem that the reader is intended to hold Elaine in. On the counter side, our protagonist is portrayed as an earnest hero being snubbed; “Wearied of trying to get an audience with his sweetheart, Whiz goes back to the gathering honouring him, to apologize for Elaine’s action”(Legault, 36). Later, as a seeming punishment for her behaviour, Elaine’s request to join in a combat expedition is rebuffed – and she is left behind. This immense collection of “flaws” that the writer amasses against her only serves to highlight her redemption, as she stows away and fights with the men. Elaine manages to save the life of her companion, despite her perceived weakness. After taking the initiative, Whiz goes from demeaning her to; “Good girl Elaine, I don’t know how you happened to be here, but you’re mighty welcome!” (Legault, 43). This stands as the perfect example of redemption through military action, even from a group so marginalized as to be scorned and left behind for petty misbehaviours. Elaine therefore serves as a figure who, by taking action to aid the military cause of her friends, becomes a heroic figure in her own right; one whose prior misdeeds are erased by bravery. A reflection of women’s new status is found in my WOW issue, in the character of Loraine. She inhabits the story of “Dart Daring,” as the love interest to the titular protagonist. My issue opens to her brave rescue of Dart from a tribe of angry natives, in which she scales a sheer cliff by herself, sneaks by a hostile camp, and unties our indisposed hero. This is a far greater display of agency than other female characters throughout wartime comics; who often find themselves the victim of unfortunate circumstances rather than the solution. The writer does, however, portray her exploits in language far less heroic than applied to Dart. “Her heart misses a beat,” “Loraine, fear gripping her heart…” (Legault, 5). Her fear is emphasized, and she does not exhibit the cool courage of her male counterpart. And yet, the fact remains that Loraine indisputably clambers up a towering cliff, and braves a camp full of enemies to untie her friend. These feats far exceed being tied to various objects to be used as bait- a fate that inordinately befalls other female characters in many wartime comics. In a time where love interests were often portrayed as kidnapped, threatened, or helpless to create tension, Lorraine’s agency is a heroic new tone. That a heroine could perform heroic deeds in a similar league as a male character is a new brand of story, a portrayal of new, redeemed women, capable of playing stronger roles in w society. Beyond the world of comic books, the concept of women engaged in the war effort blossomed into the idea of wartime Heroines. These women stepped up to aid the war effort, and were acclaimed for doing so. The acclaim was built into the image of women as selfless, patriotic individuals who stepped up to aid their country in its time of need. The wartime service changed the concepts of men and women’s work; instead lauding women for accepting jobs that they could only dream of a decade before. 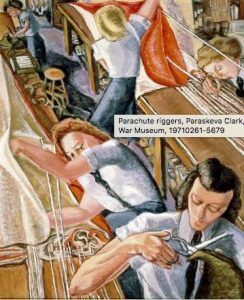 “The war effort and patriotism are presented as the artimcentral motivators for women’s work and the progressive national narrative is strongly endorsed” (Wakewich & Smith, 59), meaning that women’s jobs had become emblematic of patriotic service. The social redemption lay in this recasting of working women as noble heroines aiding their country, simply because the jobs they took were supporting the military effort. This massive shift in thought was so powerful that, even after the war, official wartime record favours the stories of exceptional heroines rather than the everyday exploits of ordinary wartime women (Wakewich & Smith, 59). 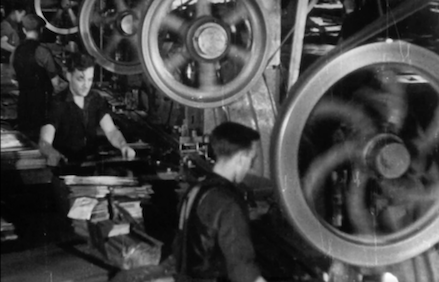 Thus, the wartime saw women rising from the marginalized social dynamic of women in the 1930s, to be given both greater access to jobs and greater social standing. This social redemption was the prime example of the power the war effort had to elevate and even glamourize marginalized groups. However, the forth issue of WOW comics is not entirely generous with this idea of redemption. While women benefit from redemption in combat, the same cannot be said for the Native Americans depicted in the story of “Dart Daring.” These faceless foes are heaped with cultural stereotypes, but with none of the redemption experienced by Elaine. They are termed both as “Howling Redskins,” (20) and “A pack of blood thirsty savages,” (19). 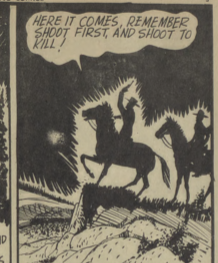 Both of these terms are meant to demean and demonize the Natives- a common practice for wartime comics that wished to display their enemies as inferior. Despite Natives being Canadian minority, the writer pulled no punches, as seen when Lorraine is told; “If your friend is wise, he will easily outsmart those varmints! They’ve been drinkin’ the fire-water given to them by some unknown renegade, and they’re on the rampage!” (17). What makes this stereotyping relevant is that Native Canadians, like women, were a minority whom where actively engaged in the war effort on the Allied side. In theory, the principle of redemption that applied to women should have aided them, however this was not the case. Native Americans were welcomed into the Armed Forces, distinguishing themselves there; “[Charles Byce] won the Military Medal in the Netherlands and the Distinguished Conduct Medal in the Rhineland Campaign. His citation for the latter was impressive: “His gallant stand, without adequate weapons and with a bare handful of men against hopeless odds will remain, for all time, an outstanding example to all ranks of the Regiment”(“Indigenous People”). Native American men were accepted and honoured for their service, same as any others. Furthermore, many in the Native community found social “redemption” of their own, a chance to be validated as true Canadians the same as anyone else; “We’re proud of the word volunteer. Nobody forced us. We were good Canadians—patriots—we fought for our country.” – Syd Moore” (“Indigenous People”). Thus, the failure of Issue #4 to portray the heroism that the Natives earned overseas appears to be the inherent preference of Comic writers to stereotype and simplify their villains for children to grasp easily. When contrasted to the respect that real First Nations individuals won through wartime service, the cruel portrayal in Issue #4 does not refute the theory of social redemption. A strong example of this idea of redemption through military service lies outside my comic, in the stories of the Japanese Canadians during World War Two. Japanese Canadians, unlike the prior two marginalized groups, belonged to a minority whose former country was actively opposed to Canada and the Allied cause. This caused deep suspicion to fall on an already maligned group. The majority of Japanese Canadians lived on the coast of British Columbia, where they were viewed with deep suspicion and distrust by English Canadians. Eventually, through a mixture of distrust, racism, and a desire to eliminate fishing competition, the Japanese Canadians were relocated all over the country, a great many ending up in internment camps (Sugiman). This kind of widespread social distrust perpetuated appalling conditions that this group were forced to suffer, their homes, possessions, and lives stripped from them. The awful conditions makes the “social redemption” that many young Japanese-Canadian men experienced by joining the Armed Services even more marked, perhaps more so than that attained by Natives and women. These men did not hesitate to join the Forces, since “For [Japanese Canadian] men, a symbolic demonstration of both loyalty to the nation and confirmation of manhood was enlistment in the armed forces” (Sugiman, 195). This show of loyalty was rewarded largely by an escape from internment camps, and a form of social approval. A young Japanese Canadian at the time, by the name of Akio, detailed in an interview the results of joining the Forces; “In almost every reference to his decision to join the army, Akio introduced two related themes: his father’s support of this decision, and his belonging in Canada as opposed to Japan” (Sugiman, 196). It seemed that joining the forces switched the social standing of Japanese Canadians from that of possible enemy agents to loyal, patriotic Canadians. This change is a drastic example of how the redemption process not only exists, but how powerful it was during the war time years. Akio goes on to detail how his military status served as a protection against the racism and discrimination of every day life; “In almost every memory story, Akio juxtaposed the harshness of such discriminatory acts with the loyalty and support of Hakujin [White Canadian] men in the army. Akio believes that his military status in some ways shielded him from the impact of the racism that Japanese Canadians encountered in daily life” (Sugiman, 207). Even the depths of suspicion that an entire ethnic group had fallen to could be redeemed by service in the military, and all that it represented- the patriotism and dedication to one’s country that endowed a social standing all of it’s own, above the stereotypes and judgements of ordinary society. To conclude, the characters within my issue- Loraine and Elaine- provide an abstract portrait of how the wider society of World War II was taught that military and combat engagement meant social elevation, and in some cases, redemption. The Native Americans, portrayal adds more nuance to the idea, contesting the reality of this social redemption with what the widespread, propaganda-like media spread. What the oral and archival evidence shows is that the social elevation of military service was profound to many minorities and marginalized groups, despite the castigation the Natives receive in my issue. In the end, the drive to win World War II was great enough to defy even the cast iron social standards of pre-wartime society. 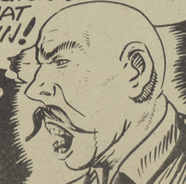 Legault , E T. “WOW Comics.” WOW Comics [Toronto, ON], vol. 1, Commercial Signs of Canada, 1942. No. 4, pp. 1–42. “Indigenous People in the Second World War.” Veterans Affairs Canada, Government of Canada, 29 Nov. 2016, www.veterans.gc.ca/eng/remembrance/history/historical-sheets/aborigin. Accessed 23 Mar. 2017.